Cambridge, MA – Scientists turn to model organisms, like mice and yeast, to investigate the biology underlying emerging diseases. But for the Zika virus, the lack of a good model hampered this type of research. Now, a team of researchers in the laboratory of Whitehead Institute Founding Member Rudolf Jaenisch has devised a way to model Zika and other neural diseases in a dish. Their work is described this week in the journal PNAS. The Zika virus was identified in 1947 in Uganda, but a 2013 epidemic in French Guinea first brought it to the public’s attention. As the disease spread throughout the Americas and the Caribbean in 2014, abnormalities, such as microcephaly in newborns, were increasingly reported when mothers were infected during their first trimester. Scientists’ efforts to better understand the virus and its mechanisms quickly hit a snag: mice, which are often used to model disease pathology, are not vulnerable to the Zika virus unless their innate immune defenses are knocked out. Additionally, neural diseases, such as those that cause microcephaly, affect cells that reside deep in the brain, and they cannot be easily accessed for observation and manipulation. In order to circumvent these challenges and to model Zika in the lab, the researchers turned to induced pluripotent stem cells (iPSCs)–adult cells that have been pushed back to a embryonic stem cell-like state. iPSCs can in turn be nudged to mature into almost any cell type in the body. In previous work, Julien Muffat and Yun Li, former postdoctoral researchers in the Jaenisch lab, were the first to use iPSCs to create microglia, the specialized immune cells that maintain the brain and spinal cord and care for them after injury. 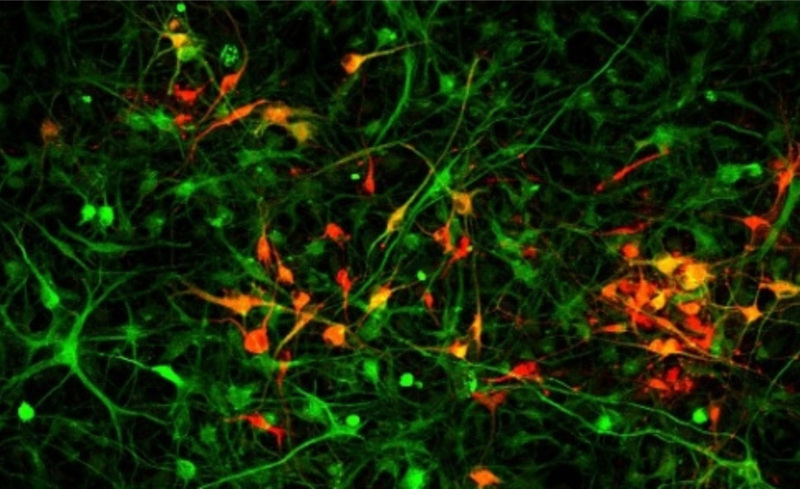 In the current work, Muffat and Li teamed up with Attya Omer, also a graduate student in the Jaenisch lab, and Lee Gehrke’s lab at MIT to study the effect of the Zika virus on iPSC-derived versions of three neural cell types critical during human fetal brain development: microglia, neural progenitors, and astrocytes. Whether the Zika virus can infect these cells and how well the cells can clear the virus could provide insight into why the virus can cause birth defects like microcephaly. Using their model, the team determined that after being infected with a strain derived from the initial Ugandan Zika virus, microglia can survive and can continue to harbor the virus. This is important because in a developing embryo, microglia move from the yolk sac to the developing brain very early in gestation. The study shows that, like their in vivo counterparts, iPSC-derived microglia could invade the immature neural tissue of a brain organoid, and pre-infected microglia could transfer the virus to the organoids. According to Muffat, this suggests that if microglial precursors are infected before their journey, they could shuttle the Zika virus to the developing brain and infect the neural progenitors residing there. Neural progenitor cells, which during gestation produce the neurons and glia that constitute the majority of the human brain, are particularly vulnerable to the Zika virus and die when infected. To better understand why these cells are so susceptible, the team compared how the Zika virus and the closely related dengue virus affect the neural progenitor cells. Dengue, which does not cause birth defects like microcephaly, triggers a strong cellular immune response, called interferon, in the neural progenitors, which enables the progenitor cells to efficiently fight and clear the dengue virus. In sharp contrast, when exposed to the Zika virus, neural progenitors mount little if any interferon immune defense. Pretreating the neural progenitor cells with interferon before exposure to the Zika virus impedes the virus’s progression and proliferation, and reduces cell death. These results suggest that therapeutically altering interferon levels could prevent some of the more dire effects of Zika infection on the neural progenitor cells. According to the team, using iPSC-derived cells has great potential for modeling Zika virus as well as many other diseases that affect the central nervous system. This work was supported by the European Leukodystrophy Association, the Brain & Behavior Research Foundation, the Simons Foundation (SFARI 204106), the International Rett Syndrome Foundation, Howard Hughes Medical Institute, the National Institutes of Health (NIH grants HD 045022, R37-CA084198, AI100190), the ELA Foundation, the Emerald Foundation, and Biogen. Jaenisch is a cofounder of Fate Therapeutics, Fulcrum Therapeutics, and Omega Therapeutics. PNAS, online June 18, 2018. Julien Muffat (1,8), Yun Li (1,8), Attya Omer (1,8), Ann Durbin (3,4,5), Irene Bosch (3,4,5), Grisilda Bakiasi (6), Edward Richards (7), Aaron Meyer (7), Lee Gehrke (3,4,5), Rudolf Jaenisch (1,2).